I really want to get back to blogging about books. I'm really trying to get back to blogging about books. And between everything that is going on at school and at home I'm having a hard time. 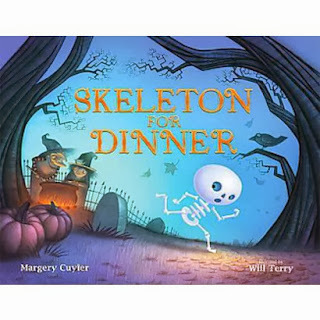 Today I'm reading aloud SKELETON FOR DINNER. Big Witch and Little Witch are brewing their favorite stew. They decide to have a dinner party and invite Skeleton, Ghost, and Ghoul. Skeleton overhears the witches talking about "Skeleton for dinner," and thinks he is part of the menu. Really fun word play. Bright fluorescent illustrations. I think kids are going to love this one! The texts come sometime during the morning. Three of them. All from Son #2. "I'm locked out of my car." "Can you send the extra key?" The extra key happens to be in the side pocket of my purse. It's been there since I drove to Arizona a few weeks ago. I debated leaving it then, but Son #2 is the type of guy who NEVER loses his keys. And gets annoyed when his mother (regularly) loses her keys. I didn't think he would need the key and I thought it would be safer with me. At lunchtime, I call him. "How did you lock your keys in the car?" "My lanyard broke. I didn't know the key wasn't on it." I try to picture this scenario. Push away other scenarios that might involve illegal or unsafe activities which could also result in keys being left in cars. Decide that since it's 9:00 on Monday morning, the story is possibly (probably?) legit. "So can you mail the key?" I sigh. Think about a day that is already going to end after six o'clock. And about the funds (or lack of funds) in my non-existent, end of month, two kids in college bank account. The key is definitely not going express mail this week. "I can, but it will probably take a few days to get there." "That's ok. Can you just mail it?" "Yeah, but it will be later on today. I'm at work." "That's ok. Just mail it when you can." "Have you mailed the key yet?" "Not yet. I'm still at work." At 6, I finish my last meeting of the day and dig through my purse to make sure the key is still there. It is and I walk out the back door, lugging my 25 pound computer bag, with the assistant principal. It's sleeting, one of those cold November rains that makes me think of chili or chicken noodle soup. There is another text. I ignore it. I get halfway to the car before I realize I am holding my son's keys in my hand. The keys that start my car are inside, on my desk, in the basement, inside the school, on the other side of the locked door. Luckily, Vanessa is more than gracious. She has a key to the building and lets me back in, even waits with my purse and computer bag, while I trudge back downstairs to get my keys. Fortunately, there is one post office that stays open late, maybe even until ten. And even more fortunately, it's not too far from my house. It's after rush hour, and traffic, which was probably bad earlier has died down. Braving puddles and driving rain, not to mention a twenty-minute line at the post office, I mail the key, My stomach growls and I remember that I only had time to eat half of the left over salad I took for lunch. I call my son. He is in the cafeteria eating dinner. "I mailed the key. It will be there on Wednesday." "Ok, thanks. I'm eating so I'll talk to you later." He hangs up. About 9:00 the phone rings. Son #2 again. "I got into the car." A kid on my floor is a locksmith. He has all of his tools at school and he opened it for me." "A kid on your floor is a locksmith?" This sounds a little unlikely. "And he has all his tools at school?" A little more unlikely. "Yeah, and he put this flat thing down the window." There is also an air pump involved in the story. I can't quite picture that. Again, I push away stories of illegal activities. "The car was dead, but I jumped it and it's all good now." "Yeah, because the key was in the ignition." "The key was in the ignition? Was it running?" "No. It was just in the ignition." Again, I try hard not to picture all of the reasons the key might have been left in the ignition. "OK, glad you got it solved. The extra key will be there on Wednesday. Put it somewhere safe, ok?" "OK, love you. Good night." Yep. Just another day in the life of a long distance mother. My boys love, love, love them some football. I love watching them and love the joy that it brings them. At the same time, football scares me a lot. I try hard to be philosophical- football keeps them busy and out of trouble, they could get hurt walking across the street, if they die they will at least die doing something that they love. And it's still really hard to watch, knowing the potential for injuries. I have to tell you that my fears weren't lessened any by reading FOURTH DOWN AND INCHES: CONCUSSIONS AND FOOTBALL'S MAKE-OR-BREAK MOMENT. This middle grade chapter book is chock full of information about concussions, and it's so, so scary to me as a mom. Author Carla Killough McClafferty has compiled a whooooole bunch of information, from a variety of sources, including doctors and professional football players, and most of it is pretty darn scary. Did you know, for instance, that a starter who plays in both high school and college will receive over 8000 hits during those 8 years? That repeated hits can lead to an irreversible brain condition called Chronic Traumatic Encephaolopathy? Or that retired NFL players are four times more likely to be diagnosed with Alzheimer's or ALS than people in the general population? Or that the the second highest number of concussions occur in girls' soccer and wrestling is third??? I know FOURTH DOWN AND INCHES would not cause my football-loving guys to stop playing. At the same time, maybe it would encourage them to be a little more careful, a little less likely to rush back onto the field after getting their "bells rung?" At least it would make them more aware of the possible long-term effects. This is definitely a book that I'd love to see in every middle and high school classroom! And I know what book I'm giving my boys for Christmas! in celebrating the pleasures of an ordinary week. and I wear a jacket. so I tie it around my waist. The middle schoolers are talking about swagg. "Do you know what swagg is, Ms. Wilcox?" "Don't I look like I know what swagg is?" The seventh grade girls look at doubtfully. "Ummm, I think you have to change your shoes. if you want to be swagging." Six-year-old M helps me clean up afterwards. Back to the storage area. Today's snack was hummus and crackers. And there is lots of hummus in the extra's box. You shouldn't make it anymore." "There are not very many in here." We have been meeting since 1995. Sometimes we talk about books. Mostly we talk about life. We have travelled many roads. Teaching. Marriage. Death. Remarriage. Adoption. Now there are more conversations about retirement. Tonight we admire panda pictures from China. Talk about colitis and osteoporosis and train travel. So grateful for these dear, dear friends. Irene Latham is hosting Poetry Friday today. I'm participating in Ruth Ayres' Celebrate This Week! Katy Perry is coming to Denver! in honor of the release of a new album. Schools were invited to create a lip dub of her song "Roar." in the Lakewood High School gym! that Katy Perry is coming to Denver. aside from the general and vague category "celebrity"
who, in this age of "rigor" and "data"
and "college and career ready"
or the essays they wrote. Really not sure why, but this school year has been a plunging, twisting, gut wrenching, bone shaking, wild ride! 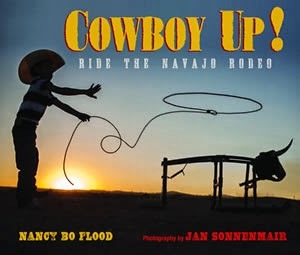 It seems only right, then, to share COWBOY UP: RIDE THE NAVAJO RODEO by Nancy Bo Flood, photographs by Jan Sonnenmair for Poetry Friday. COWBOY UP is a CYBILS nonfiction nominee. It's a great candidate, plumb filled with facts about the rodeo and gorgeous photographs of Navajo cowboys and cowgirls of all ages. 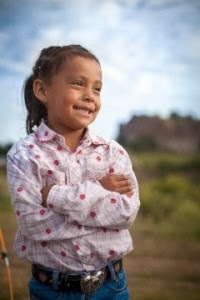 COWBOY UP could have also been a poetry nominee, however, because each two-page spread, includes not only a paragraph or two of information, but also a poem, told from the point of view of a young Navajo rodeo contestant. The poems are lots of fun- the kind you want to roll around in your mouth and just simply enjoy reading and rereading, and Jan Sonnenmair's photography is well, just about perfect! to rip a rider wide apart. Mosey on over to Merely Day by Day, where Cathy is rounding up a whole lot more poetry. Son #2 is my independent child. I am surprised, then, when the phone call comes about two o'clock on Sunday afternoon, just as I am heading out the door to mow the lawn. Son #2 is in Phoenix, coming home for an appointment. "OK, I'm at the airport. Where do I park?" "Where do you park?" I repeat, kind of stupidly. "Where are you now?" "I pulled over in the cell phone lot. But I don't know where to park." I really don't know either, where to park at the Phoenix airport. I have been at that airport lots in the last year or so, but the only place I have ever parked is in the rental car lot. I grab my computer. Google Phoenix airport. Scan a parking map. "Do you see where it says 'East Economy?'" "Ummm, yeah, OK, I got it." He hangs up before I can read him the rest of the directions about riding the Sky Train to Terminal Four. The next call comes about ten minutes later. "Ok, now what do I do with ticket?" I am surprised he already has his ticket. It doesn't seem like he has been at the airport long enough. "The ticket? You show it when you go through Security." "Noooo." I can hear exasperation in his voice. "Not the plane ticket. The parking ticket. Do I put it in the car or do I put it in my wallet?" Again, I am at a loss. "Look on the ticket. What does it say? Does it say it needs to be on the dash?" Son #2 scans the ticket. "I don't think so." "Ok, well then put it in your wallet. I always write where I parked on the back of it." "Where you parked?" he questions. "Yeah. Do you see a sign with the row number?" "Why would I write the row number?" says my ever practical, oh-so-linear child. "I can remember that." And he hangs up. Three minutes later the phone rings again. "How do I get to the airport?" Luckily, I still have my computer open. "You ride the Sky Train. It comes every three minutes." "OK." He hangs up before I can read the part about getting off at Terminal Four. I am not surprised, then, when the phone rings again about five minutes later. "Where do I get off?" "Terminal Four. Your airline is at Terminal Four." And I have pretty much given up mowing the lawn by the time the next call comes. "Ok, I'm at the terminal. Now where do I go?" I explain that he can either check in downstairs at the airlines or at a kiosk, right by Security. This time he doesn't bother to hang up. "Stay on the phone," he orders. "I want to make sure I've got this." I am prepared for problems. Because I adopted my guys when they were seven and nine, we hyphenated their last name, using the name they had grown up with first, then my name. Depending on the computer, or computer operator, that little tiny line, causes endless problems at banks, and schools, and airports. And as per usual, the hyphen causes problems today. The first time, my guy types in his name, it doesn't go through. He sounds a little stressed. "What if I don't have a ticket?" "You do have a ticket. Type it without the hyphen." Without the hyphen, it goes through. "OK, I'm going through Security." He hangs up before I can tell him not to leave his iPad. This time it is fifteen minutes before the phone rings again. "Do you have your iPad?" He is more than a little irritated at my stupid question. "Of course I have my iPad. Do you think I would leave it there?" I restrain myself from reminding him about a January trip to the airport for his brother's computer, which had been left in security. "Now I just go to the gate, right? Do I have time to get something to eat first?" I assure him that with over an hour left, he has plenty of time to get something to eat. My sons have an uncanny ability to find food wherever we are and it seems like the process will be relatively straightforward. "Are you ok now? Can I mow the lawn?" "No. Just wait until I get on the plane, ok? When I am flying you can mow the lawn." I hang up the phone and putter around the house for the next hour. No more calls come until he is boarding and he needs to know what zone he is in. There is no zone on his ticket he tells me. "Move your thumb, sweetie. It's at the bottom, right in the middle." "Have a good trip, bud, see you in a couple of hours. Love you." I hang up the phone for the 57th time. doesn't know how to find his way around an airport. Realize that this is the first time he has ever flown without some adult- me, a teacher, a coach- in charge of logistics. 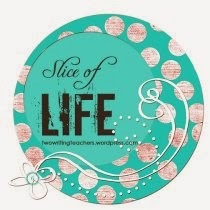 One of my favorite bloggers, Ruth Ayres, is starting a new tradition. Celebrate This Week is an opportunity to savor and appreciate the week that has just been. This school year has been hard- lots of emphasis on data and rigor and achievement and doing more and being more. I'm trying to breathe and laugh and honor and celebrate and savor the privilege of working with teachers and kids. Wednesday afternoon. The first day of after school activities. Today's offerings include two sections of Ballet Folklorico and Art Club. As well as a group of fifteen boys (and yes, today it really is all boys), waiting to get on a bus to the Boys' and Girls' Club. The activities begin in the school cafeteria, where students enjoy an after school snack, before being picked up by the club sponsors. I am in charge. Soon students will be in a routine, and things will be calm, but today, well, let's just say it's a little crazy. I explain routines. Pass out milk and snack bags. Try to explain, in my broken Spanish to a father who speaks very little English, the concept of a waiting list. All this with a shy six-year-old, who loves to dance and really wants to be part of Ballet Folklorico, but is a little unsure about staying for an extra hour, attached to my hip. Twelve-year-old B approaches from behind. I have known B for a little over a year. In that year, I cannot ever, not once, remember him initiating a conversation with me. He is an independent kind of a guy, mature, capable and self-assured. Today he wants to talk. "Ms. Wilcox, my grandpa bought me a new accordion. Do you want to see?" At this particular moment, overseeing 50 ballerinas, 20 artists, and 15 little guys who really need to get outside and run around, truthfully, the last thing I want to do is to see B's new accordion. But I am trying to slow down. To not miss opportunities to connect. To be fully present on this holy ground. And so I breathe deeply, then respond. "Sure, I'd love to see your new accordion, sweetie, can you wait about two minutes?" B sits down on the cafeteria bench behind me. Unsnaps the clasps of what looks like the brown, tortoiseshell suitcase my grandmother used to carry when she came to visit from Chicago. Waits patiently until all of the ballerinas and artists have departed for their classes. I turn to him. "Ok, show me your new accordion." My frisky friends from the Boys and Girls Club gather round, as B opens the case to reveal a gleaming black and white instrument, resting on a bed of royal blue velvet. It really is beautiful. B lifts the instrument from the case. "Can you play it?" I ask. "I have been taking lessons for two years," he says, and launches into a mini- concert. He plays two or three songs, then allows the little guys to touch the accordion. Little fingers stroke the gleaming black, touch the myriad of white buttons. They have lots of questions. "What do these buttons do?" B answers all of their questions, then puts his instrument away. The bus arrives and the kids are gone. I am left, celebrating an afternoon accordion concert in the middle of the school cafeteria. I am a literacy coach. I love my job, but once in a while I wish I had my own class. A perfect, perfect, perfect fall day. I am on the kindergarten playground, refereeing the lunch recess "football game." Mostly that means I count to ten and yell "first down" at random moments. First down means it's someone else's turn to hold the ball while the rest of team runs from one end of the field to the other to make a touch down. We are mid-game, when L runs screaming from the swings. "Teacher, you have to come. You have to come come." I follow her, wondering what I will see. These requests come often and can refer to anything from a bloody nose to a ball stuck in a tree or a child who needs to be talked down from the top of the jungle gym. Today it is a bug. A bright green leaf-shaped bug. "Look teacher," says L. "Look. That leaf has legs." I squat down next to her. Soon we are joined by four or five more kindergarten friends. F wants to squash the bug. I tell him that we are scientists watching, and scientists don't squash bugs. F counts two. L says, "No, there are four." I point out the long back legs. Two pairs of shorter legs. We count again. The group grows to ten. K suggests we should bury the bug in wood chips. I tell her that scientists don't bury bugs. She flicks one or two chips questioningly but stops when I give her my best teacher stink eye. The creature jumps. Half of the kindergarten scientists run away screaming, then come back. The group grows to 15 scientists. I wonder how the poor bug, minding its own business until a few minutes ago, feels about being surrounded by a group of scientists. We notice the bulging eyes. The antennae. 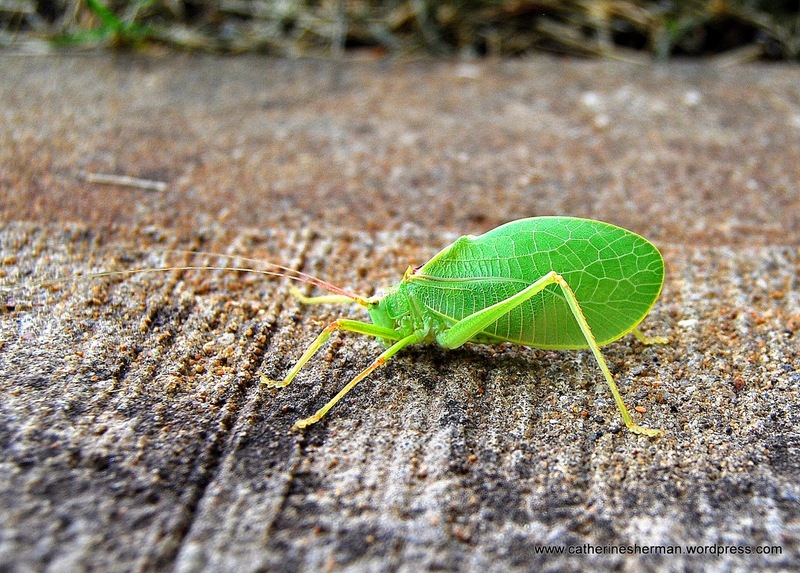 Talk about how the bug's color and shape help it hide from predators. I wish we had clipboards, so the scientists could make note of their observations. Our specimen jumps again and again, half of the scientists scream and run away. This time our buggy friend lands on D's shoe, then proceeds to crawl up his pant leg. D looks a little nervous, but stands perfectly still as I gently brush the creature to the ground. The group grows to twenty. We squat in the dirt. And then the bell rings. OK, so not a whole lot of blogging going on recently. And if I'm really honest, there has not really been a whole lot of reading going on either. I apologize-- there has been a whole lot of work going on. And a whole lot of traveling on weekends, when I might catch up on blogging, away from home. Finally, a weekend at home, and a little time to read, after three consecutive weekends away. DOLL BONES has been in my stack for several weeks. It moved to the top of the stack this week, when one of my seventh grade friends asked me for a scary book. Zach, Poppy, and Alice have been friends for a long, long time. For years, the trio has used dolls and action figures to create an elaborate fantasy world, which involves queens and mermaids and pirates and all sorts of mythical creatures. The ruler of this world is the Great Queen, a bone china doll locked in a curio cabinet in Poppy's house. It turns out that the Great Queen has a story all her own. And it's creepy, really creepy. The Great Queen was created by an Ohio china maker when his young daughter tragically died. He couldn't bear to put her ashes into the ground, so he crafted a doll, then put the little girl's ashes inside of her. And now the doll is coming to life, and wanting to be buried in her rightful place with her family. It's up to Poppy, Zach and Alice to get her there. I expected this to be a scary book. And there definitely is that element. DOLL BONES has just enough creep factor that kids are going to love it. 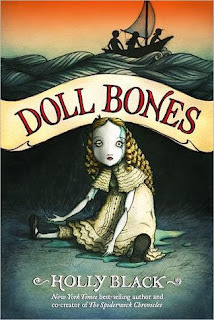 What I didn't expect, however, was that DOLL BONES is also a coming of age novel. It's a novel about putting aside childhood and moving into adolescence. It's a novel about friendships between boys and girls. And it's a novel about accepting change. DOLL BONES is a novel that I needed when I entered junior high and discovered that everyone but me was wearing makeup. And it's a novel that our seventh graders, who used to play an elaborate game of tag every single recess, but now spend their recesses leaning against the chain link fence pretending to have fun doing nothing, really need right now. Mostly, I think it's a book that my sixth and seventh graders are absolutely going to love. So last week I wrote about driving to Arizona. My son needed his car. His car with the manual transmission, to be more exact. I probably hadn't driven a manual transmission for almost 20 years. I wasn't all that excited about trying to re-acquire that skill. I had checked into transporting the car, but the cost was prohibitive. I had considered other alternatives- paying my nephew or some other poor starving college student, waiting until Thanksgiving, flying my son home and taking a couple of days off of work to drive the car back with him. And pretty much what my decision boiled down to was the fact that I'm a single mom, with two kids in college, and not a lot of left over funds at the end of the month. So I was contemplating taking a quick weekend road trip. 12.5 hours down on Saturday, then flying back sometime on Sunday. And I was terrified. Not really of the road trip- I've done lots of those by myself and I kind of like those hours of thinking and prayer; but rather of driving the darn stick shift. I hadn't driven a stick for years, maybe even 15 or 20. I wasn't sure I could get the car out of my neighborhood, let alone all the way to Arizona. Last week I sliced about the drive. I also told about a million people that I was considering it. Most people responded pretty much the way I probably would. That's a long drive! Are you sure? Can't he wait until the next break? "You can do it! I learned to drive a motorcycle at 53 years old. Go by sound..if the engine is revving, change gears. Use the parking brake if you have to start on a hill. If you're not sure about anything, push in the clutch..it's a safe bet. Good luck! And those are the words I thought about when I got in the car on Saturday morning. I was still terrified, still dreading the trip, but I kept thinking about Penny driving a motorcycle at age 53. As I started the car, I thought, "If Penny can drive a motorcycle in Malaysia, you can drive this dumb stick shift car to Thatcher, Arizona." And as I lurched out of the neighborhood, I thought "If Penny can drive a motorcycle in Malaysia, you can drive this dumb stick shift car to Thatcher, Arizona." As I drove the 700 miles down I-25 (and especially after I realized I had miscalculated and had to go one hundred miles farther south than I had planned) I thought, "If Penny can drive a motorcycle in Malaysia, you can drive this dumb stick shift car to Thatcher, Arizona." And as I drove the last 180 miles over scary, narrow, one lane, curvy mountain roads in the dark, I thought, "If Penny can drive a motorcycle in Malaysia, you can drive this dumb stick shift car to Arizona." And when I pulled up in front of the dorms, after 13.5 hours of driving, I thought about Penny. I'm so thankful for the spirit of risk taking and adventure that she has brought to my life for the past 35 years. I'm so thankful for her friendship.